Boycotts Hitting Group Behind 'Stand Your Ground' Gun Laws Two of America's best-known companies, Coca-Cola and PepsiCo, have dropped their memberships in the American Legislative Exchange Council, a low-profile conservative organization behind the national proliferation of "stand your ground" gun laws. Selina Gray of Sanford, Fla., shows her sign at a rally protesting the death of Trayvon Martin, the unarmed teen shot by a neighborhood watch volunteer. Authorities have cited the state's "stand your ground" law as a reason charges have not been filed in Martin's death. Two of America's best-known companies, Coca-Cola and PepsiCo, have dropped their memberships in the American Legislative Exchange Council, a low-profile conservative organization behind the national proliferation of "stand your ground" gun laws. ALEC promotes business-friendly legislation in state capitols and drafts model bills for state legislatures to adopt. They range from little-noticed pro-business bills to more controversial measures, including voter-identification laws and stand your ground laws based on the Florida statute. About two-dozen states now have such laws. 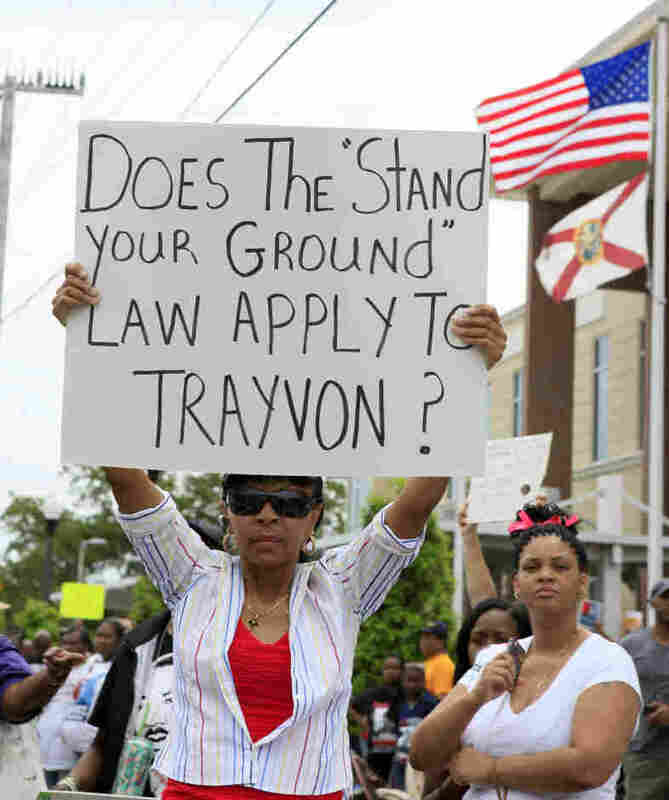 Florida's stand your ground law has been cited in the slaying of Trayvon Martin, an unarmed teen who was shot and killed by neighborhood watch volunteer George Zimmerman on Feb. 26. "We have a longstanding policy of not taking positions on issues that don't have a direct bearing on our company or on our industry," said Coca-Cola Co. spokeswoman Diana Garza Ciarlante, after the soft drink giant dropped its membership in ALEC on Wednesday. Coca-Cola's announcement came hours after a civil rights group, ColorOfChange.org, launched an online drive calling on Coca-Cola to stop underwriting the ALEC agenda on voter ID laws in several states. It's part of a much broader campaign to spotlight companies that sell products to a public that might object to hard-line conservative policies such as stand your ground laws or requirements that voters show a photo ID at the polls. "The clear and simple message was that you can't come for black folks' money by day and try to take away our vote by night," said Rashad Robinson, director of ColorOfChange. PepsiCo, another soft drink giant, belonged to ALEC for 10 years. In January, a company vice president told ColorOfChange that it wouldn't renew for 2012. He didn't say it was because of ALEC's stance on voter ID laws. But in an email to ColorOfChange, he said that issue would be considered if PepsiCo ever weighs rejoining ALEC. PepsiCo said it had no further comment. An ALEC spokeswoman said the company told them it pulled out just for budgetary reasons. ALEC declined requests this week for a broader interview. Progressive groups and shareholder activists want to drive a wedge between ALEC and its corporate members. "There was no real downside because there was no public accountability. There was no transparency," said Doug Clopp, deputy director of programs with Common Cause. "Everything up until now had been done behind closed doors, and these memberships were not known to the American people." Common Cause, a nonprofit citizens lobbying group, is also part of the campaign calling on corporate members to end their partnership with ALEC. Some of the most controversial ALEC efforts are good examples of how the organization works. In 2005, lawmakers and lobbyists took Florida's brand new stand your ground statute and turned it into model legislation, which produced a surge of similar laws in other states. Later, ALEC did the same thing with immigration laws. Its model was the unusually tough bill from Arizona. House Speaker John Boehner, R-Ohio, was once an ALEC member. "Not only does it bring like-minded legislators together, but the private sector engagement and partnership in ALEC is really what I think makes it the organization that it is," Boehner told the group in 2009. And private sector engagement is definitely what makes ALEC financially viable. State legislators pay annual dues to belong, but that makes up only about 1 percent of the organization's $7 million budget. Corporate members account for almost all the rest. Until recently, ALEC was best known for its volumes of pro-business legislation: bills to weaken labor unions, as in Wisconsin, to privatize government operations and to reduce regulation. But this new anti-ALEC campaign comes at a time when some investors have already been pushing for more transparency on corporate political activities. Tim Smith is a vice president with Walden Asset Management, which does what it calls socially responsible investing. He says corporate boards and top management are paying closer attention now. "They're scrutinizing their trade association memberships, their relationships with controversial institutes," said Smith. "And certainly I think that companies are scrutinizing their ALEC relationship more carefully, too." But certainly not every corporation: On Wednesday, another well-known company, Kraft Foods, said it was keeping its membership in ALEC. A spokeswoman for Kraft said its only concerns at ALEC are business related and have nothing to do with stand your ground or voter ID laws.